Last week, Nerf unveiled its new line of hot pink toy guns targeted at girls. Barbie and Lego have also launched toys that push stereotypes. Traditionally, girls play with dolls and boys with guns, and toy makers have been happy to play along with that notion for years. But some are starting to push the boundaries on those stereotypes. 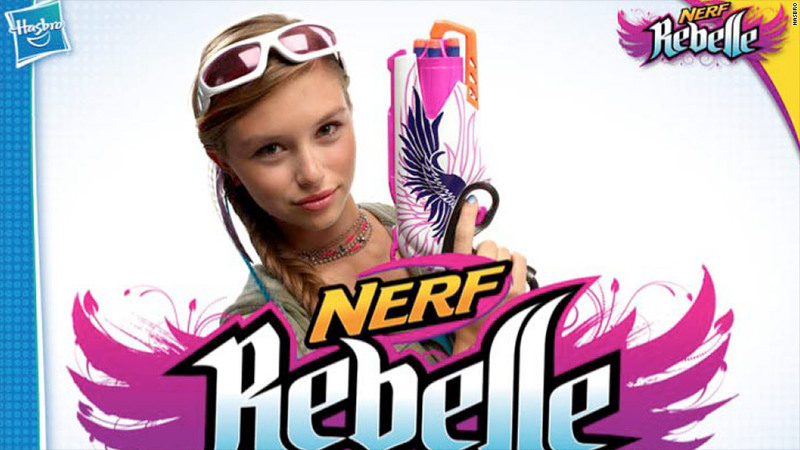 Last week, Hasbro (HAS) came out with a new line of its popular Nerf gun -- the Rebelle -- outfitted in hot pink and aimed at girls who want to harness their inner Hunger Games. It follows the launch of Mega Bloks Barbie, the first construction set from Mattel's popular doll franchise. Both come after last summer's wildly successful launch of a line of pastel colored bricks and dolls for girls from Lego. "This trend is hot because you're expanding from appealing to 50% of the market to appealing to everyone," says Gerrick Johnson, a toy analyst for BMO Capital Markets. For toy makers, it is a relatively inexpensive move because they don't need to develop an entire new line of toys from scratch. In fact, most of them use the same tools and models they use for the traditional toys, says Johnson. By giving these toys more crossover appeal, toy makers seem to be listening to their customers. Parents have gotten more open minded when it comes to how children play and what kind of toys are appropriate for their kids, according to Maureen O'Brien, a developmental psychologist who consulted with Mattel (MAT) on its Mega Bloks set. "There has always been this artificial gender distinction when it comes to play, but now it's falling away as we learn more about the advantages of different toys," said O'Brien. For example, a growing body of research show that girls who don't get exposure to construction play at a young age start could back away from science and math by the time they reach middle school. Yet toys that offer such skills have typically been marketed to boys for decades. As evidence mounts, parents want to do something about it, according to O'Brien. Toy companies have caught on to the shift in perception and are responding to the growing demand. "There's an overarching cultural dialogue that's happening in regards to gender, and that is reflected in the products coming out," said Rachel Cooper, a Mattel spokeswoman. Lego spokesman Michael McNally said that it was important for the company to address the presumption that construction play is more appealing to boys. "By inspiring more girls to build, we are able to build a new audience ...with whom we can foster skills such as patience, perseverance, confidence, self-esteem and pride of accomplishment," he said. So far, the move is paying off. Lego's McNally said that the number of girls playing with Legos tripled in 2012 after the new line was introduced. Mattel's Cooper also said the company has seen a lot of interest in the Barbie set since it debuted in December. To be sure, the new toys continue to play into some stereotypes. A Barbie construction set lets children build a fashion boutique, Lego Friends sells a pet salon, and the Nerf Rebelle comes in shades of hot pink and purple. "We're in the transitional phase, so it makes sense that companies are still trying to capitalize on people's natural 'boy' and 'girl' inclinations to get them into it," said O'Brien, the development psychologist. "Once parents realize their kids like the toys, the toys will likely get more gender neutral." Analysts believe the trend will pick up steam as companies experiment with more ways to go across the aisle. "It's driven by a simple fact," said Sean McGowan, a toy analyst with Needham Co. "If you can get a product targeted to one gender to be appealing to the other, you can significantly increase sales."